Hello guys, today I will be talking about how can you fix Error 0x80070057 from your system. But before going ahead we have to talk about some necessary things which should be always kept in mind before facing these kinds of Errors on your system. You can face Error 0x80070057 on your system while installing Windows 7 OS. 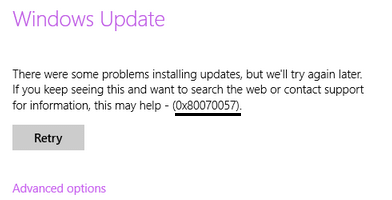 Error 0x80070057 while Creating New Profile on MS Outlook. While Updating or Installing Pending Updates Specially on Windows 10. Above mentioned are just few Common Instances when Windows users face this error. As now we know them, we will move ahead and see how to Fix 0x80070057 error for all instances Separately. Majority of Windows users are facing error code 0x80070057 while taking backup. So, we will is it on top of this post. Corrupt Registry are Evil in Windows Computers, it is Important to keep them organized and Clean. Its not recommended to Tweak Registry in your Computer by Yourself, We recommended to Download & Use Specialized tools like RegCure Pro - The Best tool that will take care of your PC by Scanning and fixing Current and future Errors. Download and install the tool to Scan for Errors, It will automatically Scan your PC to find Registry errors and other problems like Corrupt System files and Repair them. Step 1. Click Start > type “Regedit.exe” in the Search programs and files box, and then press ENTER button. Step 2. Locate and then click the following registry subkey: HKEY_LOCAL_MACHINE\SOFTWARE\Policies\Microsoft\System. Step 3. On the Edit menu, point to New, and then you have to click on DWORD Value. Step 4. Type CopyFileBufferedSynchronousIo, and press ENTER. Step 5. Right-click CopyFileBufferedSynchronousIo, and now click Modify. Step 6. In the Value data box, type 1, and click OK. This solution of Tweaking Registry has worked for few while other have reported that it didn't worked for them, So go to Solution 2 Below. Click Start > Control Panel > Date, Time, Language and Regional Options > then click Region and Language options. Click the Formats tab and then click Additional settings. In the Decimal symbol field, type . (dot), and then click OK twice. The main reason behind this Error is when the System Reserved partition (which is about 100mb default partition for BitLocker encryption, Recovering Windows, & similar System Files) gets damaged due to some reason. In this case,When you try to Re-install or Fresh install new Windows OS, You will be shown "Windows Could not Format a Partition on disk 0. The error occurred while preparing the partition Selected for installation. Error code 0x80070057." How to solve Error Code 0x80070057 while Installation ? To fix this Error from your Pc you need to delete the existing windows partition where the previous version of Windows was installed including System Reserved Partition. (generally it is located at Local Disk [C:]). Then format the disk for clear installation of Windows. Insert the Windows DVD & Start installation. Select Disk 0 partition 1, and click Delete. This step will delete the System Reserved Space. Click OK when the dialog box appears. Now select Disk 0 partition 2, and do the same steps as done with Disk 0 partition 1. Now you have some Unallocated Space, so select it & create a new partition. Note: While creating “New” disk you should be very careful. Calculate once while creating the new disk size, then click Apply. Again a dialog box appears on your screen, click OK.
Now select the Disk 0 partition 2, Format it “again”. This is it, Now go ahead and continue with your Windows Installation. This time you should not get error 0x80070057 code on your screen and you will be able to go through the installation smoothly. Windows users may get this error code while trying to install Pending Windows updates. The message you get will be like "There were some Problems installing updates, But we will try again later. (0x80070057)"
SoftwareDistribution Folder is the folder where all the updates and installation Files are stored. Most of the time, you can safely Delete this folder to get rid of errors that are caused while updating windows. Go to C:\Windows\SoftwareDistribution and delete all files from the folder. Now, Delete the folder itself. If you can't Delete it, just rename it to something like SoftwareDistributionold. Now to go to Windows update and see if this solves Windows update error 0x80070057. Sometimes your inbuilt windows firewall or Antivirus can block microsoft servers. Your Updates are Downloaded and installed from these servers and if they are blocked by your Firewall, You may get error 0x80070057 on your screen. So Temporarily Disable your Antivurus program which you have installed on your system. Also if you don't have any Such Antivirus, Simply Disable Windows Firewall. To Disable Firewall, Search Firewall in Search and click on the result. A new window will open up. Turn Off Firewall from there. You may be prompted with a warning message but just ignore it and do it for the time being. I Believe you might have Fixed the problem that you are facing but to avoid these errors in Future you might want to have take proper care of your PC to avoid future erorrs. So We recommend you to Regularly Use Total System Care and keep your Windows PC Error Free. Hi, have the same error code while trying to install Windows 10. I followed your instructions but it keeps Happening, any idea ? HI Daniel, Can you please let us know at what point you are getting this error? Like in Windows Store or While Installing/Updating Windows. Any luck? I'm having the same problem trying to transfer an mp3 file from one place to another. I keep getting this error while attempting to install Windows 10 on my PC. This happens after I format my C drive and press next to start the install process. I Still get this error message regardless of the steps I take (as outlined here). All I want to do is edit the details of a JPG photo -- write in the comment field -- and I keep getting this error code when I try to save the information. It happens in about 1 out of 800-900 image files that I've downloaded to corroborate with a colleague. The only way around it is to load the photo into a graphics editting program and resave the file. However, that has the consequence of losing all the previous data added to the fields, such as tags, comments, authors, camera make, f/stop, etc. That makes it very impractical. I think this error sometime cause. If your file or folder name is very large or very deep inside folders. That's why it is causing problems. Hello all, I am getting this error when I try to do a system restore on my computer. I am running Windows 7 Home Edition and when I try to restore, it won't update my files and it tells me to run chdsk/R then the 0x80070057 code. Help me please! I am hoping this is a self fix and not one that would cost me hundred of dollars in PC Repairs. Thanx a lot ! U saved my day ! Now I m installing wind 7. Brilliant! You fixed my problem when Microsoft couldn't. Renaming the SoftwareDistribution folder worked for me. That is a great compliment to get KIM. I am really happy to know this post helped you to fix the 0x80070057 error. You are welcome !!! I successfully the mentioned steps for installing windows but sadly I receive the same error again.. I cannot load drivers as the drivers are not available in the CD. Please help. I get this error when I try to open Outlook. I have reinstalled Microsoft Office and that didn't help. Any ideas why I get this error? shutdown /r ... I did this for restart my PC. The PC was try for restart but it took too much time. Then I can't start my PC. Here I got this error now hot fix it without losing my c: files. I get the 0x80070057 error while trying to load the troubleshooter. HI, I'm getting this error when backup to external hard drive 3tb and also my computer in windows 7 OS.. please help ASAP! I don't believe I have ever gotten this error before but I got it today after I edited and saved a rather large .mp4 file. It saved fine but then I right clicked the file and edited the properties as I always do to include the name of the video program I along have with some other information. When I went to apply the changes I got Error Code: 0x80070057: The Parameter is Incorrect. I doubt if it has anything to do with registry or directory. Any help appreciated.